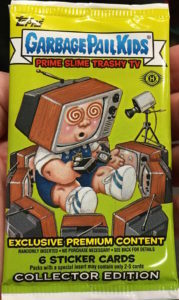 This is Part 2 of a two part series on the production of 2016 GPK Prime Slime Trashy TV. If you missed Part 1 you can go here to catch up. 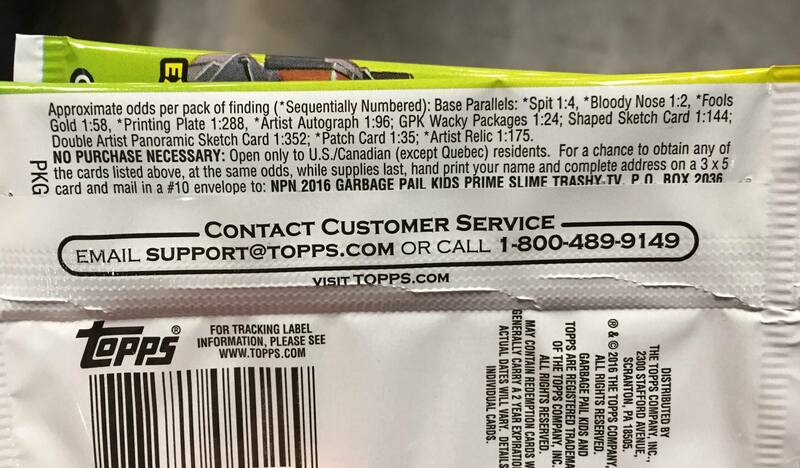 In the first post we looked at how many packs/boxes/cases were produced of 2016 Garbage Pail Kids Prime Slime Trashy TV. Here’s a review of what we came up with. I’ll be using these numbers to try to come up with an idea how many of each type of parallel and insert were created for the set. This will give you a good idea how rare a set is and how quickly you need to snap up that card for your rainbow! I’ll also compare some of this info to the previous sets for reference. As a reminder in addition to using the sell sheet and odds, we will also have to make some assumptions and flat out guesses when trying to figure some of these out. So how many of each type of card was made? We can’t figured it out for every type of insert or parallel. Some card types we don’t have enough information. Other times however, Topps is nice enough to tell us exactly how many of a card was produced. Like with the Apple Pie set, Topps decided to number many of the inserts and parallels. This means we already know most of the parallel and insert numbers already! Makes this post a lot easier! We know Spit /99, Bloody /75, and Fool’s Gold /50 for the parallels, and Relics /50, Patches /99, Autos /25 for the insert sets! Still there are some things we just can’t determine. As mentioned previously, Topps has made it more difficult on us this time around. The sell sheets no longer reveal the number of each type of sketch inserted into each pack type. This means we can not figure out each different retail pack type. Therefore, there are many retail items that we are unable to determine the production on. For example, the Yellow Pee borders. Since there is no way to break out the number of gravity feed packs from the other retail packs, we can not determine how many Pee borders were made. This also true for the various retail bonus sets; Classic Re-runs, Gross Bears, Bathroom Buddies, and Adam Bomb Your TV. However with production up in retail 26% over Apple you can be assured there are many more of all of these compared to the Apple Pie release. The lack of retail breakdown also means we can not determine how many Loaded Sketches or Panoramic Sketches were inserted into packs. While we can’t figure out the Yellow Pee parallel, we can determine how many of the other two non-numbered parallels were made. We can also find out how many of the Wacky bonus inserts were made. Bruised Borders – 35,000 Collector packs X 1 Odds (doh) = 35,000 total Bruised borders / 220 cards in set = 159 per card. Puke Borders – 550,000 Retail packs X 1 Odds (doh) = 550,000 total Puke borders / 220 cards in set = 2,500 per card. Wacky Packages – 35,000 Collector packs + 52,000 Hobby packs = 87,000 total packs / 24 Odds = 3625 total cards / 8 in set = 453 of each card made. Compared to the Apple Pie set, Puke borders and Wacky’s have increased quite a bit due to production increases. Bruised borders is actually down just slightly. One thing I always find interesting is where are all the plates hiding? Retail always had the majority of the plates because over 80% of the production is retail. We can also use plates to check our pack numbers to see if we are close. 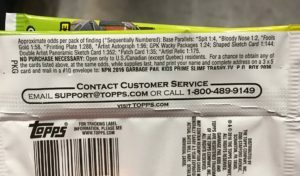 We know Topps inserted 440 plates into the production, so here is the breakdown of how many can be found in each pack type. The math looks close, that comes out to 448 total plates. There are only 180 or so Collector cases, so looking at the odds 2/3 of the cases will produce a plate. Hobby boxes continue to get the shaft. Topps has deemphasized the Hobby box the last few releases. The odds are just as long as retail, and there isn’t much extra content. Based on sell sheets for the next release, Adam-Geddon, Hobby boxes will make the complete transformation and will match Retail packs. We can also tell how many artist autos are in each pack type. While Topps for the first time didn’t reveal sketch numbers on the sell sheet, we can figure out the number of Shaped and Regular sketches inserted into pack based on the odds. Digging into the numbers for Prime Slime Trashy TV tells a familiar story. Topps has gone with the same set design now for three releases. So, the numbers look very similar to both the Apple Pie and 30th Anniversary sets. While Topps is stickling with the same set make-up for the next set, Adam-Geddon, they are drastically changing cards per pack and price point. It will be interesting to see how those changes affect production the next go around. Finally, can we figure out how many base cards were produced? Not really, but we can use what we know and give it our best guess! We know Collector packs have 4 base cards per pack, except for patch and relic packs, but that number is so small we will go with 4. Hobby packs have 9 or 10 base cards per pack this time around. When you account for inserts and parallels, I think we can use 9.5 base cards per Hobby pack. Retail packs have 9 cards per pack, except for packs containing gold dust, autos, sketches, and plates, but again that number is so small I’m going to go with 9 per pack. Base Cards – (35,000 Collector packs X 4 cards per pack) + (52,000 Hobby packs X 9.5 cards per pack) + (550,000 Retail packs X 9 cards per pack) = 5,584,000 Total Base Cards produced / 220 cards per set = 25,382 Total of each base card. These are going to be around for a while!!! This is Part 1 of a two part series on the production of 2016 Garbage Pail Kids Prime Slime Trashy TV. Part 2 can be found here. After a very successful 30th Anniversary Garbage Pail Kids set to close out 2015, Topps dialed back production on the first set of 2016 Apple Pie. However, following the Apple Pie release, Topps has used the Garbage Pail Kids brand in many different ways. Exclusive online only sets have been popular with collectors. While Topps was also said to be very happy with the sell through on the Apple Pie set. 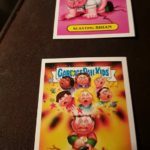 Would the online expansion of the GPK brand lead to higher production in the final set of 2016? That’s what I’m going to try to answer in this article and another one to follow. Topps has made it easy on us by keeping the set almost identical to the Apple Pie release, and continue to number many of the parallels and inserts. 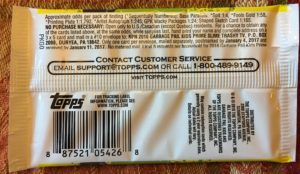 There is still a lot to attempt to figure out, and its not going to be easy as Topps has started to limit the amount of information available on the sell sheet. But, let’s give it a shot anyway! First we need to figure out how many packs were made for the entire print run. In order to do that we need to use a card type where all the odds are exactly the same in Hobby, Collector, and Retail packs. Once again there is only one card type that fits that description in this set, the Fool’s Gold borders, at 1:58. Here is what we know, there are 220 cards in the set. Fool’s Gold cards are numbered on the back to /50. Therefore, 220 cards X 50 number of golds per card = 11,000 total Fool’s Gold cards X 58 odds = 638,000 total packs made for the release. This is our first stop along the way where things could go wrong. There is only one card type shared across all pack types, so we don’t have a way to double check the numbers. Topps could have always held more Gold borders back, or the odds could be wrong. We have to use what we have available to us. I believe this is a good starting point, and gets us on the path to more information. Now let’s try to figure out how many of each pack type was created for this release. Collector packs are always the easiest to figure out because they always contain cards that are exclusively made for the set. This time there are two types of inserts and one parallel that are exclusive to Collector boxes, and are numbered on the back. The numbers come out pretty close across the board. Why don’t they match? Well, that’s a Topps mystery. Like I mentioned above the odds never work out exact. On the bloody borders, I’m willing to bet the odds aren’t exact, but rather some rounding on Topps part. I think this gives us a good number of Collector packs. I’m going to go with the 35,000 number for our purposes throughout the rest of the discussion. Now lets move onto Hobby packs. This is where things get sticky, and Topps is really making it hard on us this time around. In order to figure out Hobby packs we need a card type that is shared by both Hobby and Collector packs, and we need to know how many of that card exists. Before, we could use shaped sketch cards to figure this out. However, Topps has changed the way sell sheets are done. They no longer reveal number of sketches inserted into packs. This causes some problems, and now prevents us from figuring out some numbers. The only thing we can use is the Spit borders. We know there are /99 of each. Since we know how many Collector packs there are, we should be able to figure out the number of hobby packs. Let’s round down to 52,000 for Hobby packs. I have a couple of problems with this number. First off, I am confident of the 87,120 number for total Hobby/Collector packs being correct. However, 52,000 Hobby packs? That seems like a lot to me. That is a lot of hobby packs, especially compared to the Apple Pie release. How can that high of a number be explained? One theory I have could have to do with pre-order price. Before orders were due from distributors, the large online sellers; Blowout Cards, Steel City, DA Cards, etc. all had Collector boxes/cases for sale at very high prices. Higher than any previous set. The price didn’t make sense as the wholesale price from Topps didn’t increase set over set. It wasn’t until closer to release did the online retailers lower their prices back to “normal” levels for Collector products. Hobby boxes/cases however were selling for the usual amount. I’m starting to think collectors who usually order from online dealers put their money into Hobby rather than pay a premium for Collector boxes this time around. Another thing that could slightly be throwing the Hobby number off is actual pull rates of Spit and Bloody parallels. Some collectors have reported varying levels of pull rates not equal to the odds on Bloody parallels. Could this mean there are a few more Collector packs, and therefore less Hobby packs? Maybe, but then we have the Relic and Patch numbers that say otherwise. Once again, its always a guessing game with Topps. We can only go by the information we have. So for our discussion going forward we will use 35,000 Collector packs, and 52,000 Hobby packs. Now let’s focus on retail. We determined above that there were 638,000 total packs produced. We could simply go 638,000 – 35,000 Collector packs – 52,000 Hobby packs = 550,880 retail packs. We can check our math by using another card type that is in both Hobby/Collector and Retail packs, the Artist Autographs. How many autos are in the set? 110 cards (1 per artwork) X 25 autos per card = 2750 total autos. Let’s look at the odds and see how that breaks down per pack type. 2173 Retail autos X 245 odds = 532,385 Total retail packs. 532,385 and 550,880 are pretty close considering the large number of packs. This is one of the reasons why I’m confident we are on the right track with the production numbers for the set. I’m going to go with 550,000 total Retail packs as the number we use going forward. 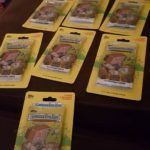 With the Apple pie set I was able to go even further and figure out how many Jumbo Retail, and Blaster boxes were created. However, like I mentioned above, because Topps no longer reveals how many sketches of each type are inserted, I have no way of breaking down the information further. Sure I could try to figure out how many Loaded and Panoramic sketches there are. There were 34 sketch artists, but did all artists really submit 9 Loaded sketches? And were they all approved by Topps, and inserted into the product? Only Topps knows that information, and they aren’t talking. So we end up with 550,000 total retail packs. This includes Jumbo retail, Gravity feeds, Blaster boxes, Blister packs, and regular retail boxes. 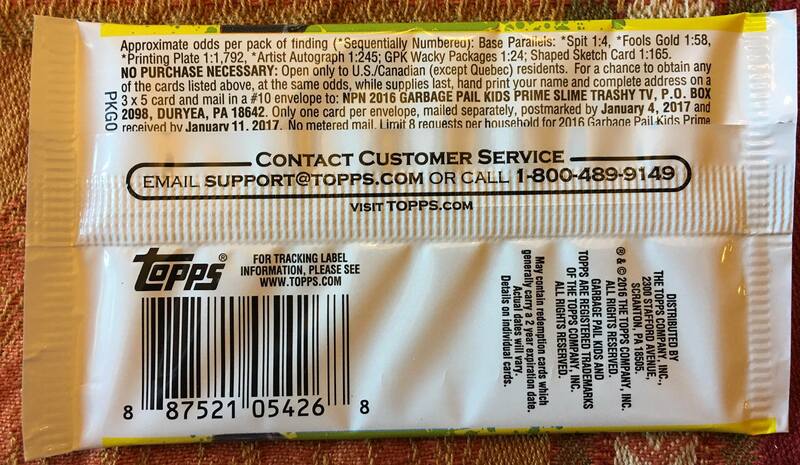 You will want to note that Jumbo Retail packs count as 2 regular packs on the odds for Topps. So you will want to take that into account. Topps prints to order their product. Which means based on distributor pre-orders, Topps decides how much product to produce. It would appear Excell really increased retail orders for this set, and customers bought a lot more hobby boxes than before. As the odds point out all inserts will be a lot harder to find when busting packs. The one thing Topps did increase was the number of sketch artists and number of sketches inserted. However, because of the large production increase sketches are also slight tougher to pull. This is Part 1 of a two part series on the production of 2016 Garbage Pail Kids Prime Slime Trashy TV. In Part 2 we will look at production numbers for all parallel and insert sets. Part 2 can be found here. 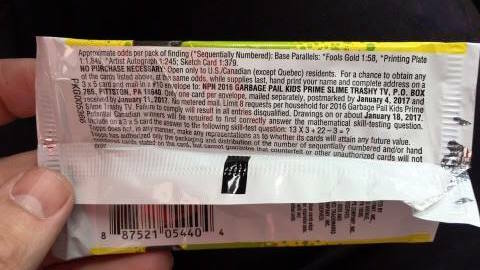 Thanks to GPK collector Mike Gatz, who looks to be the first one to find Prime Slime Blister packs in the wild. Mike found them at his local Walmart. Topps changed up the Blister pack format this set, the packs. 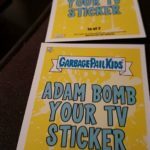 now come with 2 packs, in addition to 2 Adam Bomb Your TV bonus stickers. The Walmart price was $4.97 per Blister. 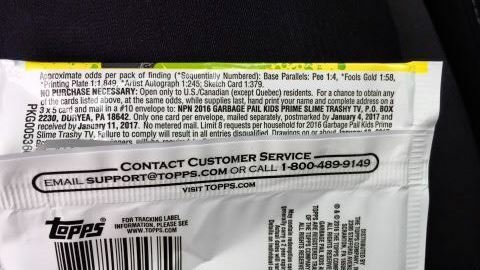 The odds on the back of the Blister are the same as a regular retail pack. Here are a couple of pictures of the packs and the bonus cards. 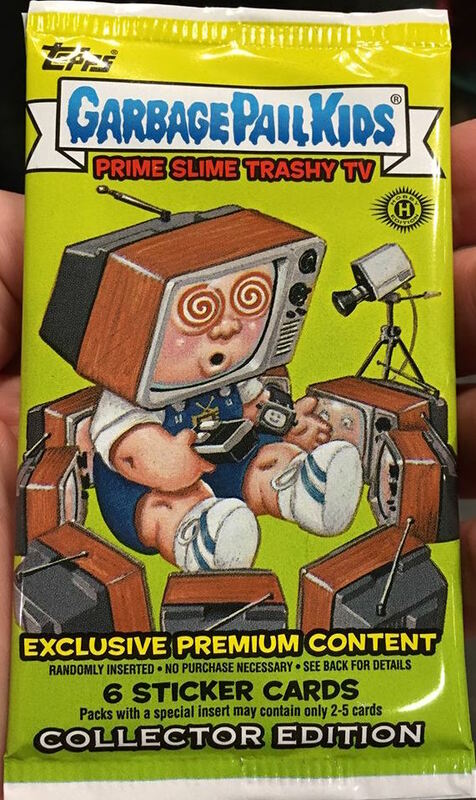 After a 9 month break Garbage Pail Kids are back with 2016 Series 2 Garbage Pail Kids Prime Slime Trashy TV set. While the theme is completely different this time around, the construction of the set is almost identical to the 2016 Series 1 GPK American as Apple Pie set. The themed base set continues with a 220 card base set made up of subsets. However, for the first time the entire base set is based on TV shows, there are no “regular” kids this time around. The base cards continue to lack card back artwork, sticker die-cuts, and numbering is on the back. Once again there are no checklist cards for the base set. Production for this set is up a lot on the Retail side, while Hobby/Collector packs remain similar. I will have the usual articles taking a stab at production numbers in a few days. Click here for the official checklist Topps released. 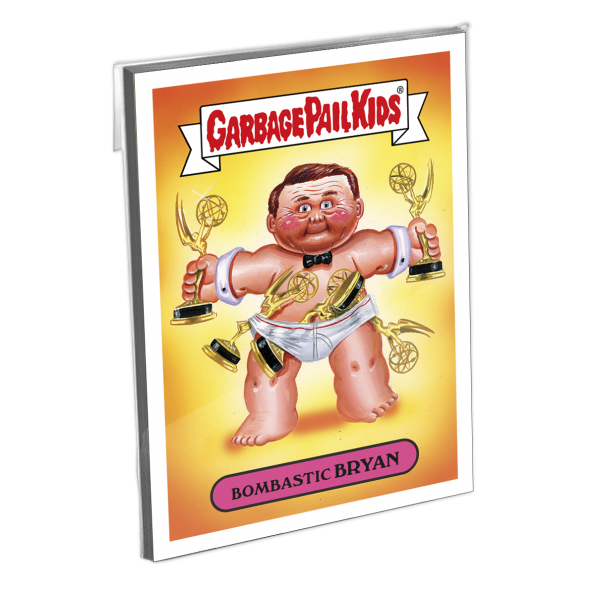 Here is what you can find, and where you can find it in 2016 GPK Trashy TV. Base Set – 220 total cards made up of 16 different subsets. 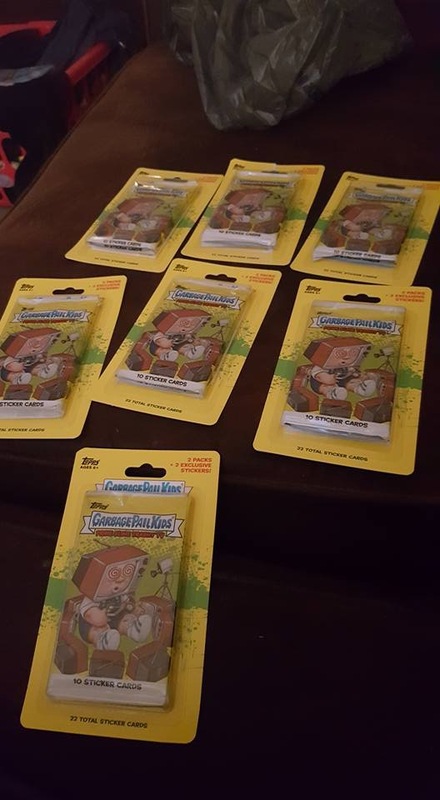 Thanks to GPK collectors Laura Ross and Ke We for sending along the Collector and Hobby Pack odds. A few things to highlight based on the Collector odds. Bloody Red parallels return to Collector packs, numbered /75 just like the Apple Pie release. Topps made no mention of these on the sell sheet. In another change, the Bloody red border cards are either pink or red depending on the card number. The red borders are the “a” cards while the pink borders are the “b” cards. This repeats a trend started in the Apple Pie series with the Black/Blue Bruised border cards. Topps has also changed the numbering on Patches and Relics. Patches are now numbered /99, meaning there are twice as many of those compared to previous releases. It will be much easier to put that insert set together. However, the artist shirt relics are now only /50. With only 4 versions on the checklist, those will be very hard to come by. Overall it seems Collector box production is on par compared to the Apple Pie release. Odds are a little tougher for card types that are shared across packs like the gold parallel, autos, and plates compared to the Apple Pie set, but that is due to retail production being increased significantly. Card types exclusive to Collector packs are either the same as Apple Pie like with the Shaped Sketch cards, or slightly lower with the Dual Artist sketches. Given there are more sketches available this time around, I’m guessing production is very close compared to the Apple Pie release. 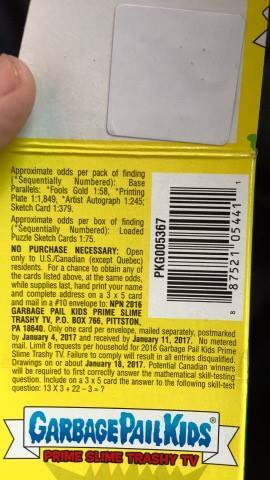 Thanks to eBay user boogiebabies2013 for sending along a picture of the pack odds for Jumbo Retail of 2016 Garbage Pail Kids Prime Slime Trashy TV. No surprises on what is included in a jumbo retail pack. As expected the Panoramic sketch cards are found in Jumbo retail packs. However what is surprising is how tough the odds are. We won’t know the full picture until all pack type odds are known, but all items are tougher to pull compared to the Apple Pie set. One very interesting thing is Panoramic sketches, despite 33% more artists than the Apple Pie set, the Pano sketches are twice are hard to pull in the Trashy TV set. It would appear a lot of Jumbo Retail packs were produced. Keep checking GPKnews as other pack types are found. The results are in, and it appears collectors did not vote in the Prime Slime Awards. 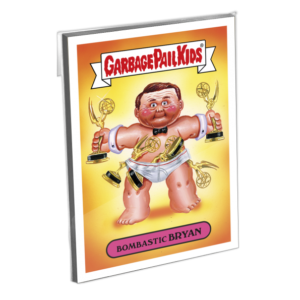 Today Topps revealed the print run information for the Garbage Pail Kids Prime Slime Awards online set. The set, which was for sale a couple of weeks back, featured entertainment personalities to coincide with the Emmy awards show. The set did not fair well with collectors as it set a record for the lowest sold online exclusive. All but one card sold only 106 copies, besting the previous low by almost 100 copies. It will be interesting to see if fans just didn’t like the entertainment concept, or if fans are just tiring of the online sets. This so far was the last online set to be sold online, as Topps moved into the almost daily release of Disg-Race to the White House cards. Here is the print run info as revealed on Topps.com. Collectors are going to have to wait just a little longer before seeing Trashy TV in stores. 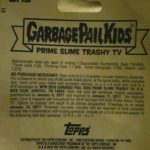 Major card distributors and online dealers have updated the release date for Garbage Pail Kids Prime Slime Trashy TV earlier today to Friday Oct., 7th. Originally, the set was suppose to release on Wed. Oct. 5th. Thanks to collector Laura Ross for the heads up. She was told by her distributor they received an e-mail with the delayed date. Both blowoutcards.com and steelcitycollectibles.com have also updated their release dates to 10/7.